We got lots of good news this morning: The DRT brushing of the potential drill target completed successfully, as did SAM's recent analysis of the Ogunquit Beach sample, and the rover is healthy and ready for more! So the weekend plan is focused on dumping the last of the Ogunquit Beach sand out of CHIMRA, which is necessary before we can test the new feed-extended drilling technique. But first, on Sol 1968, Navcam will perform a sky survey and search for clouds, as this is the cloudy season on Mars. 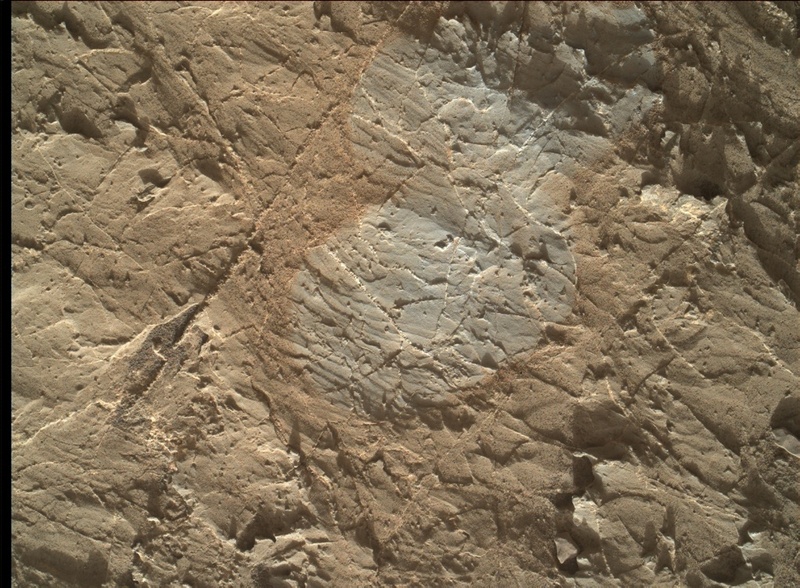 Then ChemCam and Right Mastcam will observe bedrock targets "Smoo Cave" and "St. Andrews" to sample the nearby chemical diversity. Sol 1969 will be a busy day for MSL, starting with more ChemCam and Right Mastcam bedrock observations, this time of "Yesnaby" and "Dingwall." Then the arm will get to work, taking MAHLI images of the locations where the samples will be dumped, followed by dumping of sieved and un-sieved samples in those two locations. CHIMRA will be cleaned out, then MAHLI will take images of each dump pile from 25 and 5 cm above them. Finally, the APXS will be placed over the pile of sieved material for an overnight integration. The next morning (Sol 1970), APXS will be retracted so that MAHLI can take another image of sieved material, to see whether and where APXS touched it. Then the arm will be moved out of the way for Mastcam and ChemCam passive spectral observations of the dump piles, and ChemCam LIBS measurements (with Right Mastcam documentation) of red clasts named "Fladda." Just after sunrise on Sol 1971, Mastcam and Navcam will measure the amount of dust in the atmosphere, and Navcam will search for clouds and perform another sky survey. This plan will get MSL through the holiday weekend, and tactical planning will resume Tuesday morning.